Maple Pecan Pie is, perhaps, my favorite of the classic Thanksgiving pies. Pecan pie has always been a favorite (though I’m fond of pumpkin custard, too). Growing up, my mother’s south Texas favorites covered our holiday table: oyster and cornbread stuffing, seafoam salad and – of course – pecan pie. They have a place on my table, too, right next to the slow-roasted turkey and the cranberry mandarin relish. I should clarify: the oyster stuffing and pecan pie have a place. I’ve yet to find room for the concoction of lime green Jello and Cool Whip that is seafoam salad. What I don’t love about pecan pie is its white sugar and corn syrup. So, a few years ago, I began making Maple Pecan Pie, that is I reduced the sweeteners, replace the refined sugar for whole and unrefined sugar (you can find it online or at well-stocked health food stores) and use maple syrup which, unlike cloyingly sweet corn syrup, offers a bit of depth to its sweetness and tempers all that sugar with minerals like manganese, zinc, and calcium. Now a sweetener, refined or not, is still a sweetener and should be minimized, but we also need to recognize and honor the place of good food in celebration and revelry. I also use pastured lard, sprouted spelt and pasture-raised eggs in this pie – offering a bit of goodness to an otherwise decadent sweet. The sweet, deep flavor of maple syrup complements the richness of pecans in this classic pecan pie. This recipe calls for well-sifted sprouted spelt flour (you can find it here) as well as pasture-raised lard (learn how to render it here). I also favor using vanilla bean powder (available online) which offers a more intense flavor than vanilla extract. Using a standmixer, whisk flour with salt, then cut in lard and continue to whisk until the flour resembles corn meal. Remove the whisk attachment, and replace it with the dough hook. Slowly add the cold water and process until the dough forms a ball that cleans the sides of the bowl. Remove the ball of dough from the mixer, and roll it our between 2 pieces of parchment paper until it is ⅛-inch thick. Place the disc of dough into a 9-inch pie pan and place in the freezer while you prepare the remaining ingredients. In a large bowl, beat eggs with cane sugar, maple syrup, melted butter and vanilla bean powder. Remove pie crust from the freezer, pour in filling and arrange pecan halves on top. Bake until the crust is golden, but the center is still wobbly - about 40 minutes. Allow to cool completely before serving. It’s at the beginning part (step one, and top 3 ingredients). I never did find the recipe for sprouted spelt puff pastry. Every time I click on it I get an error message. Does anyone have that recipe? Here’s the recipe for sprouted spelt puff pastry. I should go correct that link! https://nourishedkitchen.com/sprouted-spelt-puff-pastry/. We used to live near someone who had a commercial walnut orchard who told us about walnut pie. I love pecans but my husband prefers walnuts as they aren’t as sweet. I tried making pecan pie with walnuts and I actually preferred it…which is saying something because I don’t like walnuts. Oh this looks beautiful and delicious. Is there any potential replacement for the sugar? I can eat everything else in the recipe but if I add the sugar I have a nasty reaction. Any suggestions? Hi. I would love to make this gorgeous pie. What would be equivalent be for the vanilla powder if I am using vanilla extract? Thanks! I’ve got that Texas Pecan Pie love as well I only make one once a year.. and this year Im gonna have to try yours… Thanks!! Happy Thanksgiving! My family and I don’t consume lard. What are some lard substitution? Can pastured butter be used instead of lard? What about coconut oil? Can I use sifted whole wheat pastry flour and butter as substitutes for the spelt and lard? I have made pie crust with whole wheat pastry flour and it turns out fine, though not this exact recipe. I am going to try it the way you suggest (since it’s what I have on hand), and will let you know. But feel free to post your results if you get around to trying it first! Pecans fall from the trees here in the South (Arkansas) in the fall like millions of tiny gifts from the majestic trees that produce them. We gather them with rolling pecan harvesters and take them to the farmers market to have them shelled by machines. Then we take home the bounty and the pie baking begins. Thank you for this recipe. I am sure I will find it authentic and satisfying as you have admitted an “unnatural love” of pecan pies. That’s a very nice way of putting it – my family likes to describe my affinity for this nutty goodness as “insane”! Here is an updated version of our favorite from growing up. I just made some for Thanksgiving with our family. Combine cream cheese, sugar, egg, salt & vanilla. Spread over bottom of pie shell. Sprinkle pecans evenly over cream cheese mixture. Pour topping over pecan layer. (You can arrange 5 pecan halves, resembling a star in the center of each pie, just for facncy, before pouring topping over it.) Bake in preheated oven 375 degrees for 40 minutes or until golden brown. I love pecan pie also , with the sprouted spelt crust it will be even more yummy. 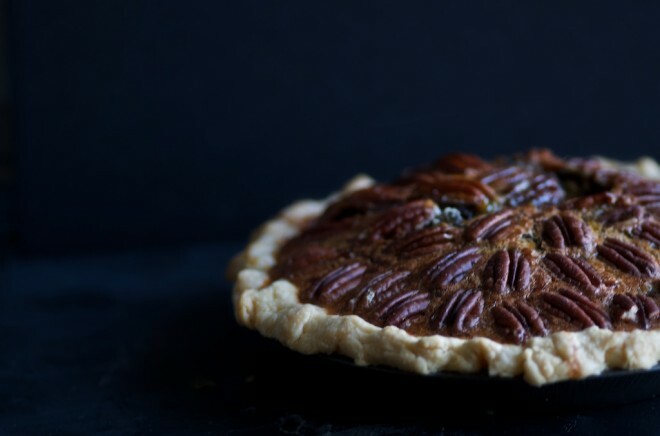 Have you seen Mark Bittman’s pecan pie recipe? It is delicious and does not use ANY corn syrup or syrup of any kind. It would be easy to choose good sugars in the ingredients as well as other whole foods. Generally it is an excellent recipe and is easy to find on the web. Why do the pecans need to be soaked, and for how long (and for how long do they need to be “dehydrated”) – all prior to making the pie? Could they (the pecans) be soaked (marinated?!) in whiskey prior to making the pie? Love the option of not needing to use corn syrup – maple syrup is a great option! Can the lard be replaced with coconut oil? Where do you find vanilla bean powder ? Abe’s Market and Azure Standard online has it. Could this pie work with chopped walnuts? They grow locally where I live in Northern California, can be found at my farmers market, and are cheaper than pecans. why not use coconut sugar in place of the cane sugar? Thank you, I will try this one. I have been making a star anise infused maple syrup pie that is quite good but a bit involved and this will simplify things. I like the bourbon idea too!